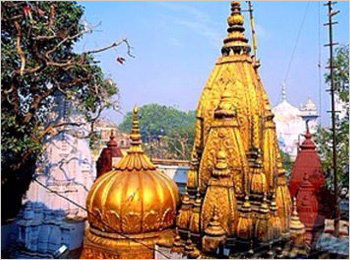 Kashi Vishvanath Temple is one of the most famous Hindu temples and is dedicated to Lord Shiva. It is located in Varanasi, Uttar Pradesh, India, one of the holiest places in the Hindu dharma.The temple stands on the western bank of the holy river Ganga, and is one of the twelve Jyotirlingas or Pillars of Light. The main deity is known by the name Vishvanatha or Vishveshvara meaning Ruler of The Universe. The city of Varanasi is also called Kashi, and hence the temple is popularly called Kashi Vishvanath Temple.The Temple has been referred to in Hindu Scriptures since bygone eras and is an integral part of worship in the Shaiva tradition.The temple has faced many hardships and has been razed and rebuilt a number of times. Its turbulent history ended during the reign of Aurangazeb who built the Gyanvapi Mosque over it.The current temple, as it stands was sanctioned by Ahilya Bai Holkar of Indore in 1780 AD, and constructed on an adjacent site.Since 1983, the temple has been managed by the government of Uttar Pradesh. During the religious occasion of Shivratri, Kashi Naresh (King of Kashi) is the chief officiating priest and no other person or priest is allowed to enter the temple sanctorum. It is only after he performs his religious service, that others are allowed to enter. As per Hindu mythology, Lord Shiva married Goddess Parvati on Mahashivratri and Gauna (consummation ritual) was performed on Rangbhari Ekadashi. 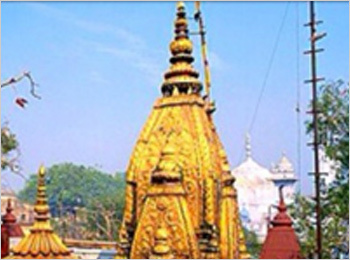 Residents of Kashi – the abode of Lord Vishwanath – celebrate the occasion with great pomp and splendor.As per tradition, devotees carried the idols of Lord Shiva and Goddess Parvati in a palaki (palanquin) from the house of former mahant of Kashi Vishwanath Temple. A conch, damru and other musical instruments accompany the procession as devotees head to the sanctum sanctorum of Kashi Vishwanath Temple and offer gulal and rose petals to the deitiesKashi Vishwanath Temple is one of the most famous temples in Varanasi, also known as the Golden temple, dedicated to the Lord Shiva. This makes Varanasi a tourist spot because of its great religious importance to Hindus. The gold used to cover the 15.5 m high spire of the temple was donated by the Punjab Kesari, the Sikh Maharaja Ranjit Singh. Since 28 January 1983, this temple has been the property of the government of Uttar Pradesh and it is managed by Dr.Vibhuti Narayan Singh, and overseen by the Kashi Naresh.The Kashi Vishwanath temple is located in the heart of the cultural capital of India, Varanasi. It stands on the western bank of Indias holiest river Ganges. The Kashi Vishwanath temple is the center of faith for millions of Hindus. The Jyotirlinga of Shiva, Vishweshwara or Vishwanatha, enshrined in the Kashi Vishwanath temple, is considered the most powerful in India. In Hindu religion it is believed that a simple glimpse of the Jyotirlinga will absolve one of their sins and grant enlightenment. A single darshan of Vishweshwara Jyotirlinga holds greater merit than the darshan of the other jyotirlingas, scattered in various parts of India. The Kashi Vishwanath Temple has been a living picture of the timeless cultural traditions and highest spiritual values of the region. The Kashi Vishwanath Temple attracts Hindu devotees and foreigners with equal gusto. The Lord Vishwanath is considered to be the supreme repository of the spiritual truth and strengthens the bonds of universal brotherhood. Vishwanath Temple is located amidst the crowded lanes of the holy city of Varanasi, also known as Kashi and Banares. It is believed that Varanasi is the point at which the first Jyotirlinga, the fiery pillar of light by which Shiva manifested his supremacy over other Gods, broke through the earth’s crust and flared towards the heavens. More than the Ghats and even the Ganga, the Shivalinga installed in the temple remains the devotional focus of Varanasi. Millions of pilgrims converge here to perform an abhishekam to the Jyotirlingam with the sacred water of river Ganga. The largest festival celebrated at the Kashi Vishwanatha Temple is Maha Shivratri, and draws hundreds of thousands of devotees each year. The city of Varanasi, is the oldest town in India, as per historical records.Kashi Vishwanath Temple stands on the west bank of Indias holiest river Ganga and be approached from a lane called Vishwanatha lane. Inside the courtyard is the temple of Vishwanatha surrounded by many subsidiary shrines. The new Vishwanath Temple situated in the premises of Banaras Hindu University, is managed by the reputed industrialists - the Birla family. Varanasi is so old that it is a part of Indian mythology and finds mention in the epics Ramayana and Mahabharata. Through the ages Varanasi has also been known as Avimuktaka, Anandakanana, Mahasmasana, Surandhana, Brahma Vardha, Sudarsana, Ramya and Kasi (or Kashi - the City of Light).The oldest living city in the world, Varanasi is the ultimate destination of all Hindu pilgrims searching for moksha from the cycle of birth and re-birth. The word ‘Kashi’ originated from the word ‘Kas’ which means to shine. Steeped in tradition and mythological legacy, Kashi is the ‘original ground’ created by Lord Shiva and Parvati, upon which they stood at the beginning of time.Millions of devotees travel to Kashi annually to seek benediction and spiritual peace by the darshan of this Jyotirlinga, which confers liberation from the bondages of maya and the inexorable entanglements of the world. The Kashi Vishwanath Temple attracts visitors not only from India but abroad as well and thereby symbolises mankind’s desire to live in peace and harmony. Vishwanath being a supreme repository of this spiritual truth thus strengthens the bonds of universal brotherhood at the national as well as global levels. On January 28, 1983 the Temple was taken over by the Govt. of Uttar Pradesh and its management ever since has been entrusted to a Trust set up by Dr. Vibhuti Narayan Singh.The former Kashi Naresh, stands in as president and an Executive Committee with Divisional Commissioner as Chairman. The Temple in the present shape was built way back in 1780 by Late Maharani Ahilya Bai Holkar of Indore. In the year 1785 a Naubatkhana was built up in front of the Temple by the then Collector Mohd. Ibrahim Khan at the insistence of Governor General Warren Hastings.Vishwanath Gali in Varanasi is the road that leads to Kashi Vishwanath Temple. The street is famous for shops selling ladies’ accessories and shops selling pooja goods and sweets. The best part about these shops is that everything is affordable. The remains of the erstwhile temple can be seen in the foundation, the columns and at the rear side of the mosque. The temple was managed by a hereditary group of pandas or mahants. After the death of Mahant Devi Dutt, a dispute arose among his successors. In 1900, his brother-in-law Pandit Visheshwar Dayal Tewari filed a lawsuit, which resulted in him being declared the head priest.Beside its religious significance, the temple is also an architectural marvel. The magnificent edifice offers a breathtaking view to the onlooker. Noteworthy about the temple is the 15.5 meter high gold spire and gold dome. There are three domes each made up of pure gold.Kashi Vishwanath is foremost of all jyotirlingas and called king of jyotirlingas. Lord Brahma after his duel with Lord Vishnu mediatated here at Dasaswamedh Ghat worshipped the Jyotirlinga and conducted Ten Aswamedha yagnas on the banks of Ganges to get rid of his sin. Hence this area is very pious. This temple is regarded as the most important temple by many leading Hindu saints including Adi Shankaracharya, Shivananda, Ramkrishna Paramhans, Swami Vivekananda, Dayananda Saraswati, Tulsidas and Guru Nanak who all have visited this temple. The temple complex consists of a series of smaller shrines, located in a small lane called the Vishwanatha Galli, near the river. 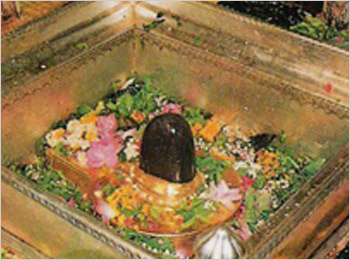 The linga of the main deity is made of black stone and stands at 60 cm tall and 90 cm in circumference. It is housed upon a silver altar. The main temple is quadrangle and is surrounded by shrines of other gods. There are small temples for Kaalbhairav, Dhandapani, Avimukteshwara, Vishnu, Vinayaka, Sanishwara, Virupaksha and Virupaksh Gauri in the complex. There is a small well in the temple called the Jnana Vapi also spelled as Gyaan vapi (the wisdom well). The Jnana Vapi well is located to the north of the main temple and it is believed that the Jytorlinga was hidden in this well to protect it during the time of invasion. It is said that the main priest of the temple jumped in the well with the Shiv Ling in order to protect the Jyotirlinga from invaders.According to the structure of the temple, there is a sabha or congregation hall, leading to the inner garbha griha or sanctum. Structure of the temple is composed of three parts. The first compromises a spire on the temple of Lord Vishwanath or Mahadeva. The second is gold dome and the third is the gold spire atop the Vishwanath carrying a flag and a trident.Though the interior of the temple is not large and elaborate it presents the peaceful atmosphere ideal for worship. According to the Shaiva philosophy, it is considered that Kashi Vishwanath Temple is the midpoint of worship. There is a Gyanvapi Mosque located adjacent to the temple indicative of the secular nature of all the inhabitants of this cultural city.Kashi contains five sacred territories, symbolizing wholeness. Five is considered to be Shiva’s number. Shiva, one of the trinity of Hindu pantheon is the controller of time and the destroyer of the universe; He is Varanasi’s patron deity. The five sacred routes delimit their own territory and reflect the various myths. The pilgrimage always begins and ends at Vishweshwara temple – the pillar at the center of the world, or axis mundi. The five sacred routes/zones are also associated with the symbols of the divine body, transcendental power and sheaths. These are analogous with the five broad elements of nature according to Hindu mythology. There are five main pilgrimages routes in Kashi, three of which have their center or foci at the Kashi Vishwanath temple. The two outermost ones, the Chaurasikroshi and Panchakroshi are centred on Madhyamaheshwar temple instead, indicating that this too was once an important temple. The inner three routes, the Nagar Pradakshina, the Avimukta yatra and the Antargriha yatra, are centred on the Kashi Vishwanath temple.The temple is situated between the Dasashwamedh and Manikarnika ghats. Open to devotees between 4am and 11pm, everyday over twenty liters (over five gallons) of milk are used to bathe the linga. Records do not indicate the first founder of this deity, but it is said that Shiva Himself established the linga. There are no existing records of the first iteration of the temple either. The temple has been embellished and renovated since very ancient times, even at the time of Gautama Buddha, who gave his first sermon in nearby Sarnath. The spire rising above the sanctum sanctorum was gilded by the Lion of Punjab, Maharaja Ranjit Singh, in 1839 thus earning it the name ‘The Golden Temple’. The Golden Temple is the sacred center of Kashi. As such, it is protected by seven concentric circles, each composed of eight Ganesha images, which are spread out through the holy city. These Ganesha murtis, one for each of the points of the compass, combine to form the 56 Vinayakas (Vinayaka, the Great Leader, being one of Ganeshas titles), and the pious pilgrim may endeavor to visit them all in turn. The number and location of the 56 Vinayakas represent a spatio-cosmological model indicative of the eight cardinal points, seven layers, three realms/segments and the associated routes of pilgrims. This clearly symbolises the concept of a universe within the universe. The pilgrimage is usually undertaken on the fourth day of the fortnight of the waning moon, every month. If the day falls on a Tuesday, the pilgrimage is considered more meritorious.There is endless list of places having deep historical and cultural roots in Varanasi. The beautiful temple of Vishwanath, with a lilting arrangement of prayers in the background, on the banks of the Ganges is a liberating experience for any devotee. There are many access points to the banks of the Ganges from the city. These are commonly known as Ghats. Devotees usually visit the ghats to have a ritual bath and perform puja to the rising sun while immersed in the Ganges. It is a very spiritual and serene beauty to see people performing morning prayers in Varnasi. The Dasashvamedh ghat offers a magnificent view of the Ganges riverfront. Other special ghats are the Asi, Barnasangam, Panchganga and Manikarnika. 7 km from the railway station is the temple which is dedicated to Lord Rama. It is believed to be situated where saint-poet Tulsi Das lived and has written the epic Ram Charit Manas. An exquisite structure of white marble, it has the text of Ram Charit Manas engraved on its walls. 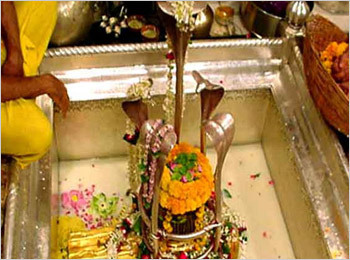 The Kashi Vishwanath Jyotirlinga is placed in a silver metal box and devotees are allowed to touch the linga. There is separate queue for devotees to offer abhishekam and pooja services to the Lord.As one enters the temple premises from the southern side, to the left are three shrines in a row one behind the other. These shrines house Vishnu, Virupakshi Gauri and Avimukteshvara Vinayaka respectively. After these shrines, a cluster of five lingas are enclosed in a shrine, dubbed the Nilakantheshvar shrine. Just above the Avimukteshvara Vinayaka are shrines of Shanishchara and Virupaksha. To the right, just by the entrance is the shrine of a linga called Avimukteshvara. There is a controversy regarding the original Jyotirlinga at the place, which suggests that not the Vishwanatha but the Avimukteshvara is the original Jyotirlinga. This controversy can however, neither be confirmed nor denied.According to some scholars the other lingas like the Mahakala, Nikumbheshvara, Dandapanisvara, Vaikuntheshvara, kala Bhairava, kapileshvara, Kubereshvara bear the names of Yakshas.There are also images of Saubhagya Gauri,Shringar Gauri,Savitri,Vighneshvara Ganesha,Vyaseshvara, etc. along with a cluster of small lingas to the north which is called the court of Vishwanatha.The iconographic form of Lord Shiva, the Lingam, represents the unity of the three states of the universe viz., Srishti (Evolution), Stithi (Existence) and Samhara (Involution) which work in a cyclic process of infinity. All these states are controlled by the Trinity which comprises of Brahma-The Creator, Vishnu-The Preserver and Shiva-The Destroyer. It is said that Kashi Vishwanath has the mantra to salvation and those who live in Kashi get Aarth (meaning of life), Dharma (lawfulness), Karma (ability to act freely) and moksha (salvation). The temple has been mentioned in the Puranas including the Kashi Khanda (section) of Skanda Purana. The obvious and complete chronicles of the temple are recorded in the Shiva Purana. The legend of the Kashi Vishwanath Temple is as follows.At the time of creation when no one was there, only Lord Brahma and Lord Vishnu were present. They both fought for supremacy and used their most powerful weapons against each other. This carried on for thousands of years. Finally, they both unleashed weapons of mass destruction that would have ended the worlds when an endless pillar of fire rose between the two, absorbing their weapons.Both Brahma and Vishnu wanted to find the end of this ethereal form. Brahma assumed the form of a Swan and flew upwards while Vishnu assumed the form of a Boar and went downwards. They declared that whoever found an end first would be the winner. Neither was successful however, even after 100 years. Vishnu gracefully admitted defeat while Brahma lied about finding the end of the pillar, corroborated by the false testimony of a Kewada flower. In his infinite wisdom, Shiva saw through Brahma’s lies and cursed him that he would never be worshipped on Earth and would hold no standing during yagnas. He also cursed the Kewada flower such that it would never have a place in any offering to the Gods. Shiva blessed Vishnu to be worshiped till the end of eternity. Lord Shiva then preached the truth that they were, all three of them, part of Omkara (that which is everything). Brahma the Creator, Vishnu the Protector and Shiva the Destroyer, comprise this holy trinity. Shiva, being the last to complete the cycle is called Mahadeo or great God and giver of Moksha. It is said that for those who bathe in the Ganges and worship Kashi Vishwanath, Lord Shiva utters the Tarak mantra in their ears at the time of death which gives Salvation.The jyotirlinga is the supreme partless reality, out of which Shiva appears. The jyothirlinga shrines, thus are places where Shiva appeared as a fiery column of light, piercing the three worlds. There are 64 forms of Shiva, not to be confused with Jyotirlingas. Each of the twelve jyothirlinga sites take the name of the presiding deity - each considered a different manifestation of Shiva. At all these sites, the primary image is lingam representing the endless Stambha pillar, symbolizing the infinite nature of Shiva. The twelve jyothirlinga are Somnath in Gujarat, Mallikarjuna at Srisailam in Andhra Pradesh, Mahakaleswar at Ujjain in Madhya Pradesh, Omkareshwar in Madhya Pradesh, Kedarnath in Himalayas, Bhimashankar in Maharashtra, Viswanath at Varanasi in Uttar Pradesh, Triambakeshwar in Maharashtra, Vaidyanath Jyotirlinga, Deogarh in Deoghar, Jharkhand, Nageswar at Dwarka in Gujarat, Rameshwar at Rameswaram in Tamil Nadu and Grishneshwar at Aurangabad in Maharashtra. The Manikarnika Ghat on the banks of Ganges near to the Kashi Vishwanath Temple is considered as a Shakti Peetha, a revered place of worship for the Shaktism sect. The mythology of Daksha Yaga, a component of Shaivite literature is considered important to the explanation of the origins of the Shakti Peethas. It is said that Shiva came to the Kashi Vishwanath Shrine through Manikarnika after the death of Sati Devi.The legend behind Kashi goes as follows. Nirvikar Chaitanya and Sanathan Brahma assumed the form of Saguna Vishwarupam from the initial Nirguna Roopam. The Shiva Shakti Roopam separated to become the Purusha and the Prakriti (man and nature respectively). They were both dictated by Shiva to meditate so that they may together, conjure the highest order of being that was both beautiful and evolved. To provide a safe haven for them, devoid of disturbances, Shiva created a wonderful city by the name of Panchakoshi. Even Vishnu inhabited the city from time to time, to meditate. During the time of Vishnu’s presence at Panchakoshi, many springs gushed from the ground. Amazed at this vision, Vishnu tilted his head and a single gemstone fell from his crown, thus earning the place the name, Manikarnika. From Vishnu’s navel rose a lotus with Brahma on it. Shiva ordained Brahma to build this world we live on. It had fifty crore Yojanas of area and fourteen lokas. In order to save the lives of these who are bound by their own actions or karma, He gathered the Manikarnika region along with the waters and set it upon this Earth where Kashi now stands. Shiva Himself established the saviour Muktidayak JyotirLinga, and proclaimed that He would never forsake his devotees. It is said that Kashi will not be destroyed when Brahma’s day ends, but during Pralay i.e., final destruction of the world. Hence, Kashi is known as Avimukta Kshetra. In Kashi, the Avimukteshwar Linga is there forever. It is believed that even those depraved souls can attain Moksha here. The holiest city of Panchakoshi, is capable of destroying every conceivable sin. It is home to a special kind of Moksha by the name “Samyugha”. It is said that even the Holy Trinity wish to pass in this city. Sarwaguna from inside and Tamoguna from outside, are the qualities of Rudra here. When prayed to, Vishwanatha Bahagavan, Sri Shankar made this His abode and resided there with Parvati. Another legend dictates that Lord Shiva himself chose Kashi as his holy abode. In order to please his mother-in-law i.e. Goddess Parvati's mother, he asked Nikhumbha to build a shrine for him. Nikhumbha, delegated the task to Anikumbha who then engaged Divodas to help in the construction. Pleased with their work, Lord Shiva blessed them all. However, Divodas did not experience any of his boons come to realization. Enraged he demolished the structure. Simultaneously, Nikhumbha also cursed the place saying that it will remain uninhabited. On hearing this, the Lord retreated to Kashi along with his consort, Goddess Parvati. Content with the place, the Goddess began distributing food with her own hands. This anecdote has been carved out in the temple of Devi Parvati that lies besides the primary shrine. Lord Shiva is also seen with a bowl of food beside the Goddess. Shiva sent two ganas to the city to see how to get rid of this king. However, they fell so much in love with Kashi that they established themselves just outside the city and never went back. They did not have the guts to go to Shiva and say, “We love the city too much.” Shiva sent two more – they never came back either. Today, at the four corners of Kashi, there are four gana sthanas, where these four guys settled. Then he sent Ganapati – he never came back either. Afterwards, he sent Kubera who also did not return he never came back. Finally, he decided to go himself, and he did not want to go back either. All this is being said to tell people how beautiful this city was. When Agastya Muni was asked to leave Kashi and go south, he cried and wrote a heartrending poem, running into hundreds of stanzas, about the beauty of the city and the pain of leaving. The earliest record of the Kashi Vishwanath temple states that it was built in 490 AD. Then again in 11th century it was revamped by Hari Chandra. The original Vishwanath temple was destroyed by the army of Qutb-ud-din Aibak in 1194 CE, when he defeated the Raja of Kannauj as a commander of Mohammad Ghori. The temple was rebuilt by a Gujarati merchant during the reign of Delhi's Sultan Iltutmish (1211-1266 CE). It was demolished again during the rule of either Hussain Shah Sharqi (1447-1458) or Sikandar Lodhi (1489-1517). Raja Man Singh built the temple during Mughal emperor Akbar's rule, but orthodox Hindus boycotted it as he had let the Mughals marry within his family. Todarmal, Akbar’s treasurer, further re-built the temple with Akbar's funding at its original site in 1585. In 1669, Aurangazeb ordered its demolition and constructed the Gyanvapi Mosque on that site. The original shivalinga was thrown in a well inside the temple to prevent it from falling into the hands of Muslim rulers. In 1742, the Maratha ruler Malhar Rao Holkar made a plan to demolish the mosque and reconstruct Vishweshwar temple at the site. However, his plan did not materialize, partially because of intervention by the Nawabs of Lucknow, who controlled the territory. Around 1750, the Maharaja of Jaipur commissioned a survey of the land around the site, with the objective of purchasing land to rebuild the Kashi Vishwanath temple. However, his plan to rebuild the temple did not materialize either. In 1770, Malhar Rao's daughter-in-law Ahilyabai Holkar constructed the present temple adjacent to the mosque. In 1828, Baija Bai, widow of the Maratha ruler Daulat Rao Scindhia of Gwalior State, built a low-roofed colonnade with over 40 pillars in the Gyan Vapi precinct. During 1833-1840 CE, the boundary of Gyanvapi Well, the ghats and other nearby temples were constructed. Many noble families from various ancestral kingdoms of India and their prior establishments continue to make generous contributions for the operations of the temple since then. In 1841, the Bhosales of Nagpur donated silver to the temple. 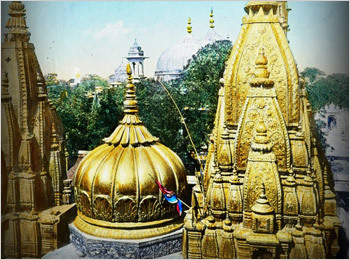 In 1839, two domes of the Temple were covered by gold donated by Punjab Kesari Maharaja Ranjeet Singh. The third dome remained uncovered for a long time till the Ministry of Culture & Religious Affairs of the U.P. Govt. took a keen interest in the gilding of the third dome. The most auspicious festival of the year occurs on the 6th night of the dark Phalgun (Feb or March) every year. On the auspicious day, devotees observe fast and keep vigil all night in celebration of Mahashivaratri. Mahashivaratri marks the night when Lord Shiva performed the 'Tandava' (dance). It is also believed that on this day Lord Shiva was married to Parvati Ma. On this day Shiva devotees observe fast and offer fruits, flowers and bel leaves on Shiva Linga. Thousands of devotees throng to the temple on this Holy night and celebrate the Lord with pomp. Lakhs of people take a dip in places like Ganga Sagar & Prayag and pray to the Sun God. The festival and Pongal is widely celebrated in the South as well, and in Punjab it is celebrated as Lohri & Maghi. Aside from their pious offerings to the Sun God, Gujaratis also offer thousands of colorful oblations in the form of beautiful kites all over the skyline. This gesture may be an attempt to reach their glorious Lord, or to invite oneself into the fold by calling on the next best thing, Vayu (wind). It is also said that Bhisma Pitamaha waited till this day before leaving his mortal body. Makar Sankranti marks the day when the glorious Sun-God begins His ascent and entry into the Northern Hemisphere. Sun for the Hindus stands for Pratyaksha-Brahman - the manifest God, who symbolizes the one, non-dual, self-effulgent, glorious divinity blessing one & all tirelessly. Sun is the one who transcends time and also the one who rotates the proverbial Wheel of Time. The famous Gayatri Mantra, which is chanted everyday by faithful Hindus, is directed at the Sun God to bless them with intelligence & wisdom. The Sun not only represents God but also stands for the embodiment of knowledge & wisdom. Lord Krishna reveals in Gita that this manifested divinity was his first disciple. Once, in the month of Phalguna (February - March), the holy fast of Amalaki Ekadasi arrived, conjoined with Dvadasi. This particular fast would bestow especially great benefit. Amalaki, the offspring of Lord Brahma, was capable of destroying all kinds of sinful reactions. Amalaki, is actually the form of Brahman, and was once worshiped by Lord Ramachandra Himself. Whoever circumambulates her is therefore immediately freed of all his sins. If the Amalaki tree isn't available then worship the sacred Tulasi tree. Also plant the sacred Tulasi seeds, and offer lamps to her. Annakoot is celebrated to commemorate an episode from Sri Krishna's childhood. After the prayers, traditional worship and Aarti, numerous varieties of sweets and 56 bhogs would be raised in the form of a mountain before the deity. After the metaphorical consumption of the offerings by the Lord, the devotees take Prasad from it. Shrawan Maasam is an especially auspicious month for the devotees of Lord Shiva. Special decoration is been done on every Monday of the month. On the first Monday of the month, Shiva graces his devotees dressed as Himself while on the second Monday, the Lord Bhagwan Shankar and Parvati idols are decorated. On the third and fourth Mondays, Shri Ardhanarishwar and Shri Rudraksha are decorated and presented to the devotees, respectively. The whole month of Shrawan Maasam is celebrated with great enthusiasm as it is highly auspicious. Every member of Lord Shiva's family is decorated and special 'Jhoola Sringar' is being performed. Akshya Tritiiya is considered one of the four most auspicious days of the Vedic Calendar. It is the third day of the new moon of Vaishakh month (April-May). One popular practice is the purchase of gold on this Holy Day. 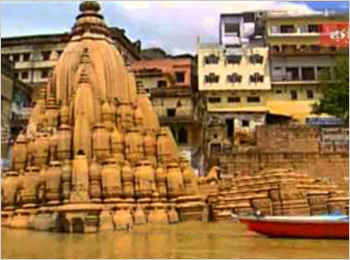 Kashi is believed to be the most ancient city on the planet. Though there is more legend available than historical proof, there still remain a number of rare facts related to the temple. 1. The Jyotirlingam at Kashi is believed to be where the pillar of light first broke ground. It is the most significant of the 12 jyotirlingams and is equivalent in power to them all combined. 2. The lingam is embedded in silver and open to the touch of devotees. This cannot be seen in any other temple. 3. Thousands of devotees throng to this temple that lies on the banks of the Ganges. 4. The Avimukteswar Lingam is said to be the original jyotirlingam that lies within the Gyan Vapi. 5. It is said that those who breath their last here attain Moksha. 6. Geographically, the Gyan Vapi is said to lie at the centre of the city and that the life of the city is drawn from this well. The temple opens at 3:00 am. 4:00 am to 11:00 am, 12 noon to 7:00 pm, 8:30 pm to 9:00 pm general Darshan is allowed. In the Hindu ideology, Moksha is the ultimate aim of every soul. Every soul must move towards breaking the cycle of life and death through their Arth (knowledge), Dharma (Responsibilities) and Karma (Actions). A soul that is liberated from this materialistic world is said to have attained Moksha. It is a long and tedious process to the path of enlightenment. However, it is said that those who bathe in the pure waters of the Holy Ganges and pray to Kashi Viswanatha before breathing their last, will attain Moksha immediately. Thus, almost every Hindu deigns to take on this pilgrimage at least once in their lifetime. Another tradition requires that the devotee forgoes one worldly pleasure of theirs. This could be anything from the desire for money to a favorite vegetable. Tradition also dictates that pilgrims must ideally take water from the Ganges and deposit at Rameswaram and then bring back sand from Rameswaram and deposit it in the Ganges. This is akin to a cycle of life and having completed this, pilgrims are asked to lead a more enlightened life. It is also believed that devotees are immediately transported to Shiva’s very own abode, Mount Kailash, by His messengers as opposed to being dragged off my Yama himself. The impressive shrine holds a strong spiritual importance for Hindu devotees. It is believed that the first ray of light fell on Kashi, when the Earth was formed. Since then Kashi has become to be a center for spirituality and knowledge. As per legend, after spending numerous years in exile, Lord Shiva appeared in Varanasi and stayed at this place. Lord Brahma greeted him by sending a chariot of 10 horses to the Ghat. Dashaswamedh, means 10 horses. It is said that the shrine of Lord Shiva is the mind of Varanasi. The architectural pattern of the temple structure epitomizes the ancient Indian styles. A close view of the pattern of the ruins of the temple reveals to be of mixed character, and composed both of Jain and Hindu orders. ‘Vishwanath’ is believed to be the ruler of the Universe and where would He belong but at the centre of the Universe, Kashi. The place is mentioned repeatedly in the scriptures - the Brahmanas, Upanishads and the Puranas. It is the oldest center of learning and the University here is still widely respected for its Sanskrit, Philosophy, and Arts faculties. Hyuen Tsang, the Chinese traveller visited Varanasi in the 7th century and recorded his travels and observations. The ancient nature of Kashi is enforced in the words of Mark Twain who said of Kashi: Benaras is older than history, older than tradition, older even than legend and looks twice as old as all of them put together. Being the cultural capital and origin place of scholars, writers, artists Varanasi has emerged as a hub of knowledge and enlightenment. The Kashi Vishwanath Lingam is said to hold the key to the mysteries of the cosmos and thousands of pilgrims flock to the temple to bathe the Lord in the Holy waters of the Ganges. The pilgrims visit the temple any time of the day and worship the Lord by offering flowers and bilva leaves and chanting mantras of Shiva. Aarati is performed five times a day as service to the Lord. The evening Aarati is known as Shringar Aarati and devotees can see the linga decorated with a variety of flowers. The sanctum is kept open from 5.30 am to 12 noon. The temple usually remains closed during the noon hours, and reopens in the evening at 4 p.m. The sanctum is closed at night after the last pujas are performed, usually by 8 pm. The temple complex is closed at 11 pm. Most of the prasad, milk, clothes and other offerings are donated to the poor. A melting pot of cultures from India and beyond, the architecture of Kashi reflects diversity in construction, pattern and detailing. Ancient buildings falling to ruins, strong - proud pillars, traditional balconies, red brickwork, connected congested lanes, intrusive modern buildings, soot covered temples and carpets of ash is what welcomes you to the Land of Spirituality, Kashi. For all the creatures that can be found on the Ghats of Kashi, a popular doha saying is “Rand, Sand, Seedi, Sanyasi, Inse Bacche to Sevai Kashi.” In this saying Kabir is credited to have said that, “Widows, bulls, stairs and saints, escape them all to reach salvation (or Kashi)”. With this status of being used often as an adjective, synonymous with liberation another popular phrase is Karvat Kashi also known as the final sleep. It is a belief that people travel here from far off places to finally end their lives, in the Karvat Kashi temple located in the vicinity of the Vishwanath temple complex. However, in recent times the term Karvat Kashi has been used popularly to describe a bent temple (karvat, meaning bent) located on the Ghats. Most of these Ghats have been built during the rule of the Marathas, while some however were built over the ages. Special stories linking lineages, mythologies, epics and the timelines of history are associated with each of the Ghats. There are over 80 Ghats that line the River Ganga and each unfurls a different style of architecture. Old houses, palaces, ashrams, ornate temples, haphazardly built homes can all find a space amidst the never-ending, horizontal Ghats. The Varanasi city is addressed with vivid names such as ancient city of ghats, cultural capital and so on. Varanasi becomes immensely sacred due to the existence of Mahadev (Lord Shiva). The never ending joyous spirit of the city is in close proximity with the essence of Kashi Vishwanath. While there are many complex rituals and services that are performed in the name of the Lord, the mysticism surrounding them is not taken kindly. Although there are various types of rituals, which are beautiful, if not conducted with absolute integrity, they can easily become exploitative. Hence, devotees are more wary these days and a vast number of rituals have been forgotten. There is a whole lot of science behind how they established certain aspects of the city. It was such a complex and geometrically perfect design. But Kashi is not what it used to be anymore. The superstructure of the city is broken. The center of Kashi was a powerful energy form, which created a tower of light. So many sages and saints have talked about the tower of light, and about the actual Kashi being an energy form above the city. Even today, that part is intact, but the base and the main temple have been broken. But one aspect everyone must witness if they have the opportunity – in the evening around 7:30, there is one particular ritual, which is called Sapta Rishi Aarti. After Shiva had transmitted yoga to the Sapta Rishis and they all had become fully enlightened, he sent them to different parts of the world to spread this knowledge. Before they left, they expressed their anguish, “Now if we go away, probably we will never get to set our eyes upon you again, physically. How can we have you with us when we want you?” Shiva taught them a simple process, which lives on to this day as Sapta Rishi Aarti, conducted by these priests who may not know the science behind it, but they stick to the process. This particular service is believed to generate stacks of energy that radiate to the ends of the Earth. The best time of the year for one to visit Varanasi is between October and March when the temperatures are in a comfortable range of 5-15 degrees Celsius. This is a good time to be out sightseeing as the weather is pleasant and very cool. Winter is also when festivals are celebrated with enthusiasm and fervour in Varanasi. Dussehra and Bharat Milap are celebrated in quick succession in September/October followed by the festival of lights - Diwali. The Ganga Festival also takes place in November and this is the time when people come from far and near to pay obeisance to the holy river - Ganges. Summer lasts from April to September/October and it gets really hot at this time with the temperatures shooting up to 45 degrees oC at the height of the season in May and June. The rains come in July and August bringing the temperatures down marginally but the humidity levels rise. Between May and June hot dry winds or 'loo' as it is called in local parlance, blow through the city making it quite impossible to be out in the day time sightseeing. Babatpur airport is the nearest airport, it is 30 km from Sarnath and 18 km from Varanasi. There is a direct flight that links New Delhi and Varanasi and also connects it from Mumbai, Agra, Khajuraho and many more other Indian destinations. Varanasi Junction Railway Station, also known as Varanasi Cantonment Station, situated at the city center in the cantonment area is a major railway junction managed by Northern Railways. Some of the major trains passing through Varanasi Junction Railway Station include Kashi Vishwanath Express, New Delhi - Varanasi Express, Mahanagari Express, Amritsar - Howrah Express, and Varuna Express. The city is well connected to cities all over the country like Delhi, Mumbai, Chennai, Indore and many more. The holy city of Varanasi lies on NH2 (National Highway) from Calcutta to Delhi and is well connected by road and is easily accessible from all parts of the country. Varanasi is around 128 km from Allahabad, 240 km from Bodhgaya, 286 km from Lucknow and 565 km from Agra. There are many public and private services to this Holy City.